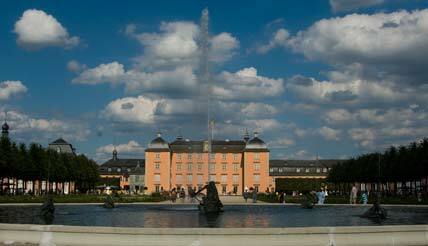 The Palace of the Elector of the Palatinate in Schwetzingen was not built as an Elector's residence but for a widow or mistress and also as a place of recreation. Its charm lies in the weightlessness of the buildings. They are not intended to express power but are simply for times of leisure. 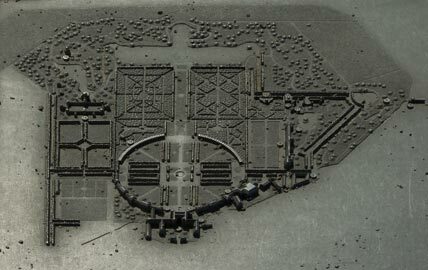 The palace is built in a semi-circle, with a large main building in the middle and two long wings designed in quarter-circles on both sides. 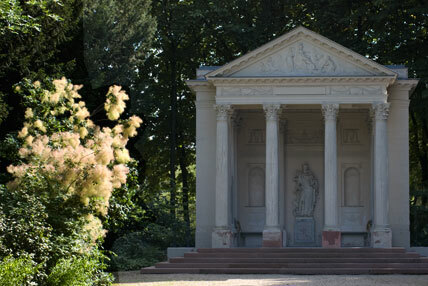 The semi-circle encloses the formally most rigorous part of the rambling, Baroque palace gardens. On both sides of the main axis of the park there is much to be discovered. Unfortunately you're not allowed to take photos in the palace itself. That is why there are only photos of the exterior here and of the splendid park. A moated castle in Schwetzingen is first mentioned in the year 1350, but not much more is heard of the castle until 1597. All that is known is that the Thirty Years' War left clear traces of destruction. In 1597 reconstruction work began on the surviving central part of the former moated castle. The moat around the fortress was for the most part filled in. However the War of the Palatinate Succession led to the renewed destruction of the castle by French troops in 1689. The palace and park did not attain their current form until the 18th century but were then spared any further destruction by war. 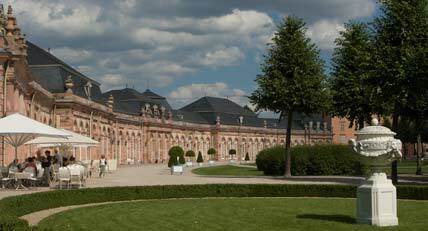 The first court gardener, van Wynder, came to Schwetzingen from Kassel. 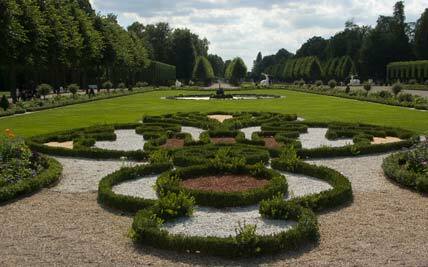 The son of the second court gardener, Friedrich Ludwig Sckell, designed the English Gardens in Munich as of 1804. Johann Michael Zeyher introduced lilac to Schwetzingen. In the course of the restoration work, which lasted from 1975 to1991, the interior rooms of the palace were renovated and furnished with authentic pieces of furniture from the 18th century. 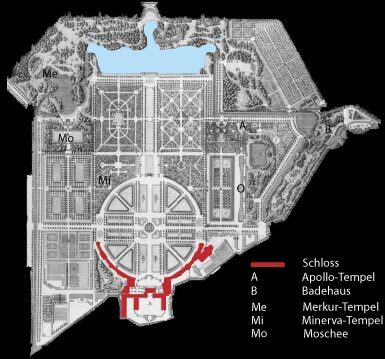 A relief plan of the palace gardens in the park of the Palace of Schwetzingen.